Back2Basics is a sports-educational based, not-for-profit organization supporting the youth of Lancaster City and surrounding communities. The foundation seeks to uplift our youth ages 8-18 through a unique combination of sporting and educational classroom style curriculum. To mentor our youth in Lancaster City and surrounding communities in developing necessary life-skills that promote accountability, team concept, sportsmanship, healthy choices, and academic excellence through the fundamental structure of athletics. To provide a state-of-the-art sporting and educational complex housing after school and online learning programs, AAU and high school sporting events and a peaceful haven for our youth to gain support and awareness for their futures through the aid of counselors, teacher aids and community leaders. Back2Basics Sports is the home for all foundation teams, camps and athletic events. 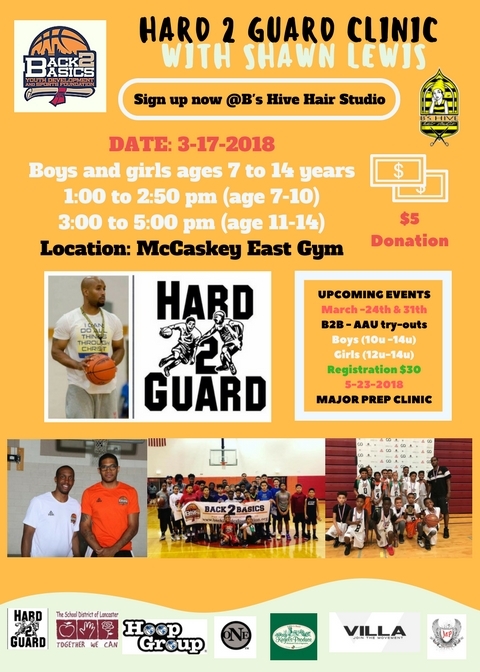 It supports one of Lancaster City's only national AAU boys and girls basketball teams and seeks to fulfill the foundation's ultimate goals. Please donate your time, services and or monetary gifts in support of our existing programs and camps. Get on board and support the youth of Lancaster City, and the surrounding community through our B2B Sports programs. Jerry Johnson is the founder of Back 2 Basics Youth Development and Sports Foundation. Currently playing in Kazakhstan for the BC-Astana Tigers, Jerry is entering his 9th professional basketball season in Europe. Although Jerry continues to have an outstanding professional basketball career in Europe, he is and always will be devoted to seeing the youth of Lancaster City succeed academically and athletically. . The community of Lancaster City, and the surrounding areas is what makes all of the work we do possible. From academic tutoring, to our AAU basketball team, we want to make sure we are involving the community in every aspect. As we grow, we continue to seek out the advice, and counsel of community leaders and the young adults that we directly work with.